What are the differences between dye-screen and digitally printed printed flags? The following explains these differences. While Flagmakers has state-of-the-art digital printing equipment that has helped us win industry awards over the years we highly recommend using dye-screen printed product for your StreetFlags. Digital technology has improved over recent years but there still remain some significant differences. 1. Lower Cost - Saves Your Money. 2. Three times the life! Get 3 - 4 seasons use - not 1! Dye-screen printed flags contain 3-4 times the dye and therefore have about 3 times the life of a digital flag. Digital flags fade much faster in UV and sunlight. You will start to see colour fade after about 4-6 weeks, whereas dye-screen printed flags will not show any noticeable deterioration until after 6-8 months of continuous exposure depending on the amount of sunlight and heat. In addition dye-screen inks protect the fabric from UV light and water deterioration for much longer as well as retaining the colours and image quality for much longer. The dyes are all solid colour and as a result produce rich and beautiful colours. Digitally printed flags use 'a 'CMYK' blended mix and as such are less saturated and can appear somewhat weaker. 4. 100% strike-through guaranteed! See the image clearly from both sides. While digital flags can get up to 80% - 90% strike-through for darker shades, for lighter shades the strike through is a lot less. So when looking at the flag from reverse the image can look somewhat faded. 5. Dye-screen flags can be used for photographic images, vignettes or shading. Even you have a complex image, we can produce these with our dye-screen printing process. Until recently we needed to produce a large run for this to be economical however. In 2018 Flagmakers developed a new process that enables shorter runs of 'CMYK' dye-screen printed flags and this has become a game changer in the market. So why select a Digital flag over a Dye-screen flag? 1. Ideal for retail flags and exhibition banners where one-sided prints are required. 3. Short run size. If you need up to 15 flags then digital flags take far less time to set up and run. For larger run sizes they can take 5-10 times longer affecting the cost. 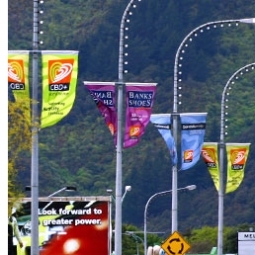 For Streetflags, which are normally seen from only 6-10 metres away, dye-screen printed flags have significant quality advantages and provide much greater value in the short and long term.